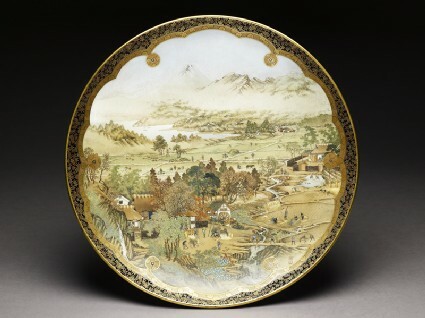 Earthenware plate decorated with a landscape in westernized perspective, in detailed polychrome enamels with underglaze blue and gilding, within a lobed border. The image signed: Itsuzan. Signed under the base, a seal-mark in underglaze blue within a gold key fret border Kinkōzan zō. With an iron red seal: Chokusai. A further factory label in English. The Kinkōzan factory was an old one, having made Kyō-yaki for several generations. 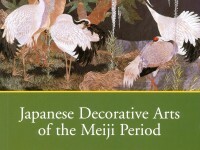 The sixth generation master, modernized the Kyōto factory, specializing in high quality Satsuma-style decorated wares. His son, Sōbei VII (1868-1927), succeeded his father in 1884. In this fairly typical plate, of excellent quality, it is interesting to see how the painter (presumably Itsuzan) has not quite understood European geometric perspective, for though there is recession vertically, there is no fixed viewpoint, and the eye is always at a right-angle to the horizontal area, just as if viewing a Japanese screen. Purchased with the assistance of the Story Fund, 1992.